A law firm has provoked disgust and complaints to the SRA after gloating on Twitter that it had succeeded in an action to deny specialised education to disabled children. 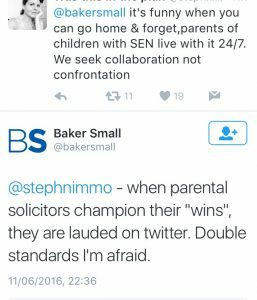 In a subsequent tweet, Small expressed bitterness that parents' lawyers are applauded when they boast about winning against local authorities, whereas he is not. Indicating that he is somehow unaware that 'parents fighting for their disabled children' comprise a significantly more sympathetic demographic than 'lawyers boasting that they have beaten parents fighting for their disabled children'. Images of the tweets spread quickly across blogs and discussion boards, with mumsnet users reacting with shock. 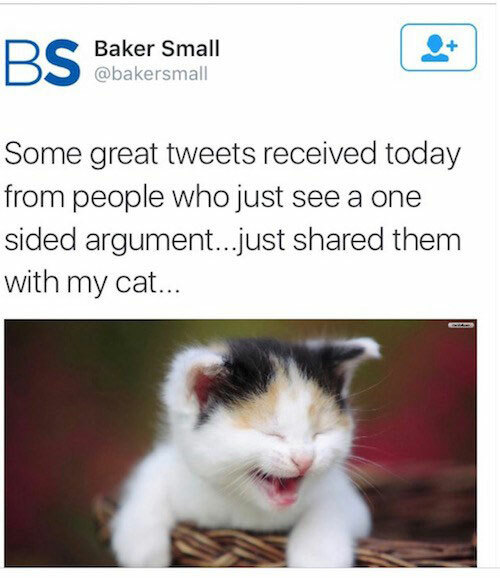 One of the offended women who engaged with Baker Small on Twitter, Diane Kay, revealed that she has written to the SRA to complain that the firm has breached Principle 6 of the Code of Conduct, by behaving in a way which has failed to maintain the public's trust. Fittingly, Small's profile on his firm's website reveals that in 2008 and 2010 he was nominated for the 'Solicitors in Local Government Young Solicitor of the Year Award' for "his work with schools". 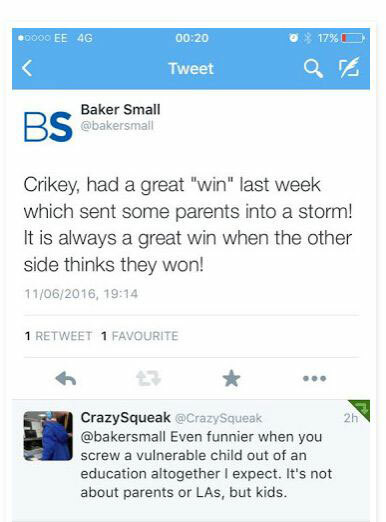 Small told RollOnFriday, "Inappropriate tweets were sent from the Baker Small twitter account, which in the context of the work we undertake both for public bodies and parents, were unacceptable and showed a lack of sincerity to Parents". He added that, "We recognise that offence was caused", which is reassuring, because only a dead person wouldn't have, saying "they were immediately deleted and a written apology was issued". Small said, "We understand all too well the pressures of the SEN system and the challenges faced by parents to secure appropriate provision and we have tweeted and spoken extensively about those issues. We are sincerely sorry for the tweets and for the upset caused." A spokesman for the SRA said, “We take all complaints seriously and will examine all the available evidence before deciding on an appropriate course of action”. Christ, see you next Tuesday, Baker Small - we all end up getting tarred with that rather nasty and smelly brush thanks to you. I will tell my councillors that we won't vote for them if they use you.